18ct White Gold Princess Cut Sapphire and Diamond Engagement Ring — Form Bespoke Jewellers Ltd.
A bespoke white gold engagement ring with a princess cut sapphire and diamonds. The focus of this beautiful engagement ring is on the colourful combination of princess cut stones. The customer selected their perfect sapphire from a selection sourced by our expert jewellers. 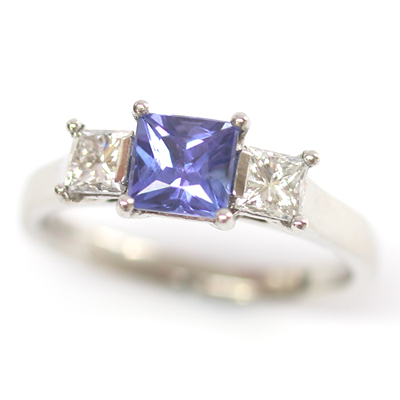 A bright, purple-y blue, this sapphire complements the cool tone of the bright white diamonds exquisitely. The trilogy of princess cut stones are hand set in an elegant white gold setting and each are held in place neatly by four claws. The 18ct white gold metal once again incorporates that crisp, cool and contemporary tone. 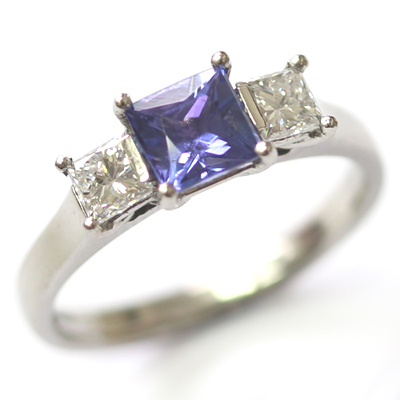 We love this sapphire and diamond trilogy engagement ring and the customer was thrilled too.